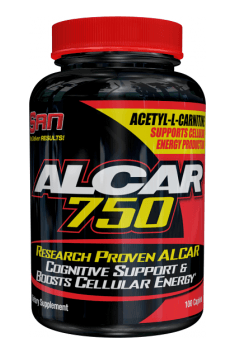 SAN® Nutrition ALCAR 750 is a dietary supplement composed of Acetyl-L-carnitine in a perfectly absorbable and highly bioavailable form of hydrochloride. The product promotes high mental and physical capacity. It acts well during periods of chronic stress- it can strengthen the memory, increase the ability to focus attention and improve an intellectual performance. In addition, the supplement has a significant anabolic potential, which can be used by physically active people. It will support efforts to develop muscular and non-fat body silhouette. Acetyl-L-carnitine (ALCAR, ALC) is a chemical compound which is the acetyl ester of an amino acid called L-carnitine. The ethyl molecule present in its structure gives it special properties. It allows to efficiently overcome the blood-brain barrier and act in the nervous system. In addition, the antioxidant and neuroprotective properties are attributed to this substance. It also acts as a precursor to the production of acetylcholine. Acetylcarnitine is very active in the central nervous system. Thanks to the content of the ethyl molecule it easily gets there because it efficiently overcomes the blood-brain barrier. It acts as a donor of acetyl groups that are required for the synthesis of acetylcholine. Upgrading the production of this neurotransmitter results in improving memory and increasing mental performance. Scientific research suggests that acetylcarnitine may also affect the levels of dopamine and serotonin. Thanks to this, it helps to improve mental well-being, promotes motivation, energy and willingness to act. Well suited to people who feel overworked, lack vigor and ‘driving force’. Acetyl-L-carnitine has a beneficial effect on the endocrine system. Potentially, it can strengthen the secretion of the luteinizing hormone (LH), and thus contribute to the increase in testosterone levels. In addition, the researchers postulate that under the influence of acetylokarnitine, there is a sensitization of androgen receptors to testosterone. It also seems that acetylcarnitine stabilizes the activity of the hypothalamic - pituitary-adrenal (HPA) axis, which results in a decrease in the level of the main stress hormone- cortisol. The mechanism of action described above gives effects that are very desirable for physically active people. Increasing the level of testosterone with simultaneous lowering of cortisol concentration facilitates work on the figure - it helps build muscle mass, accelerates the rate of fat reduction and additionally strengthens the body's efficiency. Acetylcarnitine can also increase the efficiency of post-workout regeneration processes. Studies show that people who supplement ALCAR, after a strenuous exercise have lower levels of markers determining the degree of damage to muscle tissue. It is also worth remembering the basic activity of every form of carnitine, which is to improve the transport of fatty acids to the mitochondria. Thanks to this, the process of fat tissue reduction proceeds faster and more effectively, and the production of energy in the body increases. Acetylcarnitine positively affects the circulatory system. Thanks to its antioxidative potential, it protects blood vessels against the damage that arises when there is excess of reactive oxygen species. In addition, it supports the maintenance of the correct concentration of cardiolipin, which plays an important role in the process of cellular respiration. By reducing the intensity of oxidative stress and limiting excitotoxicity in the brain tissue, acetylcarnitine protects neurons from dying and damage. As a result, it is an excellent element of prevention of neurodegenerative diseases. In summary, SAN® Nutrition ALCAR 750 is a preparation with many applications. The product is well suited as a typical nootropic agent, but it will also be a valuable support for physically active people. Use 1 capsule up to 3 times a day. The dosage recommendations for acetylcarnitine are dependent on age and the purpose of supplementation. A good starting point is the lowest recommended dose, in the case of the presented preparation - 1 capsule. It is worth to take it in the morning, as it may disturb your sleep later in the evening. The elderly can reach ror slightly higher doses (2-3 capsules).